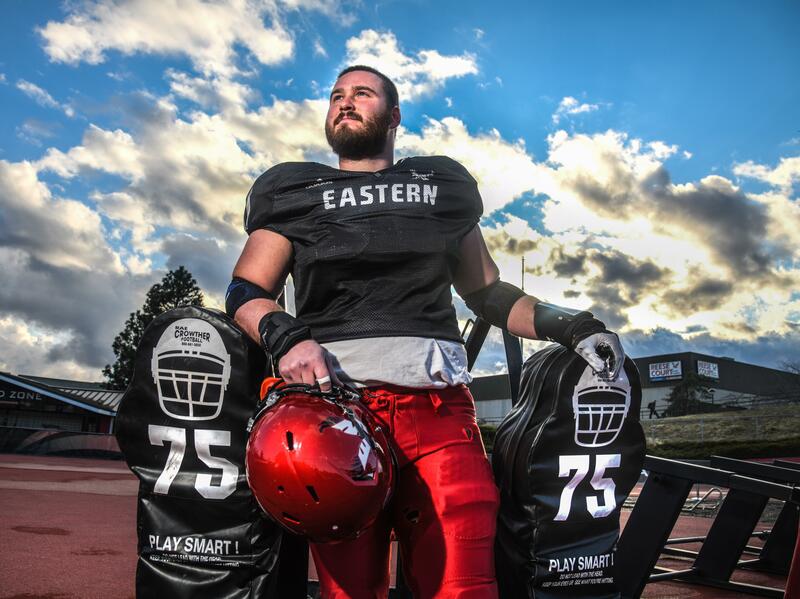 Fewer than three months after an FCS national title game loss to North Dakota State, Eastern Washington All-American center Spencer Blackburn fielded questions Tuesday on the southwest corner of Roos Field, the Eagles’ first day of spring camp. Blackburn, a sixth-year senior and of one 48 returning lettermen from the second-best season in program history, thinks the shorter break was a good thing. “We had a little less time because our last game (was Jan, 5), and some people could look at that as a hindrance,” said Blackburn, whose team only wore helmets, jerseys and shorts in the sunny April weather. “But it’s a good thing at the same time because everyone is working to be in the best shape for a game, and there’s no better shape right now if we played in January. EWU aims to ride the same momentum this spring that carried it through the playoffs last winter in hopes of returning to Frisco, Texas – home of the FCS championship game – for the third time in the 2010s. The return of a decorated, senior-laden offensive line, one of the most electric quarterbacks at the FCS level (Eric Barriere), a horde of proven running backs and receivers, and about a dozen big contributors on the Big Sky’s best scoring defense last season helps. But so does the return of a few talented commodities who sat out the 2018 season due to injury. On Tuesday, 6-foot-6, 325-pound Tristen Taylor, an All-Big Sky selection in 2017, resumed his spot at left tackle after missing 12 games last season due to a knee injury. Anfernee Gurley, one of the best true freshmen in the Big Sky in 2017, was back in the Eagles’ secondary after missing all of last season with a knee injury. At linebacker, Jack Sendelbach, a two-time Big Sky Conference Defensive Player of the Week in 2017 who sat out because of an injury, appeared healthy Tuesday with his deep position group. Talented but injury-riddled wide receiver Xavier James was also healthy, getting reps with the first-string offense after missing the last two seasons. In the 2017 spring game, James had seven catches for 130 yards and a touchdown. Antoine Custer was the first-team running back, rotating with Dennis Merritt. Tamarick Pierce, a bruising running back who averaged 8 yards a carry last season before suffering a knee injury in the playoffs, did not participate in any drills. Senior tight end Jayce Gilder – one of Barriere’s favorite targets at the end of last season – was also out Tuesday with a cast on his upper arm and shoulder area. The Eagles will also use the spring to adjust to a few new assistant coaches, including former Central Washington head coach Ian Shoemaker (offensive coordinator) and defensive coordinator Eti Ena, formerly EWU’s defensive line coach. Third-year head coach Aaron Best, the Big Sky Co-Coach of the Year last season, said his new-look staff has spent extra time together to form cohesion. Another new assistant is cornerbacks coach Allen Brown, the former EWU all-conference defensive back. With the loss of four senior corners, Brown was working with a small group of four young corners on Tuesday. EWU’s starting offensive line Tuesday included Blackburn, Taylor, right guard Kaleb Levao and left guard Chris Schlichting, all All-Big Sky players. Will Gram was getting the majority of first-team reps at left guard, formerly occupied by Jack Hunter, one of EWU’s 27 seniors last season. “Last year we were thinking that it was a talented and experienced offensive line, and many of us are now back,” Blackburn said. Blackburn and Levao were granted a sixth year of eligibility this offseason. Zach Eagle, a senior wide receiver last season who went down with a knee injury in Week 5 at Montana State, was denied a sixth year of eligibility, Best said. Published: April 2, 2019, 8:41 p.m. Updated: April 2, 2019, 9:47 p.m.